Dr. Paul Bearer's Memorial Guest Register leave condolences here. Dr. Paul Bearer's Memorial Guest Register leave condolences here. Dr. Paul Bearer’s Memorial Guest Register. Come leave your condolences to let Dr. Paul Bearer know you were lurking around his page. If he catches you, watch your back! Dr. Paul reads every comment left on his web site and if you are lucky he may leave you a personal response. Hey, I just wanted to say it was a thrill to meet you at Comic Con. I am so glad you are keeping the legacy alive. I have known who Dr. Paul Bearer was since I was toddler, My dad loved the originals and I watched them with him every Saturday growing up. I am so glad the Dr is back in town. Thank you for reviving a legend. Love Tombstone Tales, can’t wait for more episodes. It is so awesome to have you back,Doc,in any shape or form! Here’s to a long continuous afterlife and the continued resurgence of Horror Hosts! I glad that you’ve carried on the legacy. I’ll be lurking for you on Facebook & the CW & from the bushes. I LOVED your Dad. He was my neighbor in Winter Haven. And I’m glad you are carrying on the family tradition. A rainy and gloomy morning finds me lurking around your webpage to keep my spirits high, all 3 of them that haunt my grumble abode! Ghoulish greetings and have a fantastic day! I watched your show religiously as a kid growing up and have enjoyed your new stuff! Thanks for the memories! Used to watch the original, glad to see that you picked up where he left off. Your show is so much fun! Keep up the good work. My favorite ghost host! I’ll be lurking for you…. Love Tombstone Tales on select Sunday afternoons! Been a fan since day1. Still “lurking for you” lurking for me. Always a joy. Thank you for bringing back fun childhood memories and for keeping the original spirit of DPB alive. We love you, DPBII! Just coming by to say hi. Had fun meeting you at Megacon about a month ago. 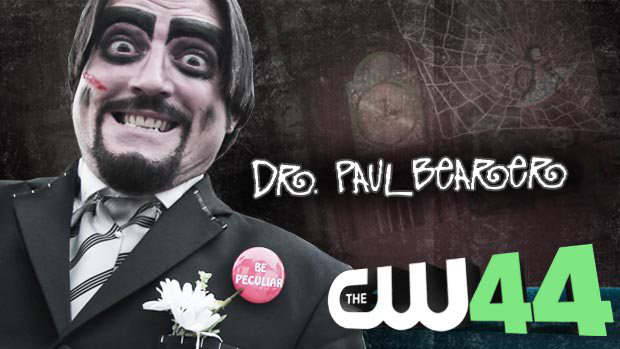 Always been a fan of the original Doctor Paul Bearer and Creature Feature, and now I am a fan of yours. I even considered dressing up as the late Doctor as an homage for Halloween. Any chance I could pay a visit to Tenement Castle one day? Keep up the lurrrrking! I use to watch your Dad’s show when i was a kid in the 80’s in Indiana. I’m glad you are continuing his legacy! Keep up the good work Paul Bearer 2. Love that you are continuing your Dad’s legacy! You are a very beautiful person…! Some of my best memories were watching Dr. Paul Bearer with my dad..I would give anything to have just a moment of that again. I miss him terribly. I also miss the original Dr. Paul Bearer very very much. wishes for a successful reanimation!! I met you well over a year ago as you were just starting to become “reanimated”. I shared with you that I watched your predecessor as a kid and loved each week’s show. I look forward to seeing you often in the years to come. I really dig Dr. Paul Bearer & have done so since the 1970’s. Glad to see the old stiff is still creeping around in 2016! He’s just good ole Horrible fun and keeps the kid in me Alive! Grrrreat Site. It’s all 6 feet under. I loved your show as a kid.and still love it to this day. I haven’t seen Hearshual around, what happened to him? I just wanted to let you know what a pleasure it was to meet you at the Fanboy expo!